More money, more problems. Example: Cyber Monday. Perhaps Ma$e was on to something. More Football, more injuries. Example: week 12. The bumps and bruises keep on coming as we barrel towards the fantasy football playoffs and the home stretch of the 2015 NFL regular season. We'll continue to do our best to try and piss off Bill Belichick, Sean Payton, and every other coach out there as we sort through all the latest and lingering injury issues with week 13 looming. Don't forget about the waiver wire; there will be some players to watch at all positions as some teams get down to the bare bones in terms of skill players. Here is your week 13 fantasy football injury report. - Falcons RB Devonta Freeman (concussion) looks on track to return in week 13. Freeman missed another game in week 12 but was seen running pregame. WR Leonard Hankerson (hamstring) also missed week 12 after he apparently suffered a setback in week 11. K Matt Bryant missed week 12 with a groin injury he suffered in practice. Shayne Graham handled kicking duties in week 12. - Ravens wideout Marlon Brown missed week 12 with a back injury. Kamar Aiken, Chris Givens, and Jeremy Butler currently sit atop Baltimore's receiver depth chart. Tight end Maxx Williams (concussion) left the win in Cleveland and did not return. Fellow tight end Chase Ford, a recent waiver claim from Minnesota, was placed on injured reserve earlier Monday with a shoulder injury. - Ben Roethlisberger is expected to be cleared through the concussion protocol after self-reporting symptoms during his team's week 12 game at Seattle. Ben was replaced by Landry Jones on the team's final drive. He is expected to be fine for week 13. TE Heath Miller left the game late in the first half with a rib injury and was only able to return briefly before being replaced by Jesse James. Miller was having a nice day before going down. - Jimmy Graham's unceremonious first season in Seattle has come to an end after the tight end suffered a torn patella tendon in week 12 against Pittsburgh. Graham will aim to return in 2016 at full-strength. In the meantime, he will be replaced by Luke Willson, who may be a player to watch given his chemistry with QB Russel Wilson. - The Cardinals' backfield took a hit in week 12 as both Chris Johnson (knee) and Andre Ellington (foot) exited their game against the 49ers. Johnson took a helmet to his knee while Ellington, who has had foot issues in the past, went down almost immediately after replacing CJ as the lead back. If both players miss time, rookie David Johnson and Stepfan Taylor will be the next men up. Johnson is reportedly dealing with a fractured tibia, which could keep the former 2,000-yard rusher out for multiple weeks. - Bills RB Karlos Williams exited his team's week 12 loss at Kansas City with a shoulder injury. Anthony Dixon will be LeSean McCoy's top backup if Williams misses time. - Panthers WR Corey Brown missed his team's Thanksgiving Day week 12 win over Dallas with a shoulder injury. He should be considered week-to-week, with rookie Devin Funchess continuing to shine in his absence. - Martellus Bennett was a surprise late scratch for Chicago's Thanksgiving night win over Green Bay due to a rib injury. Bennett was replaced by Zach Miller, who continues to enjoy his late-season resurgence. Bennett should be fine for week 13 after taking advantage of the extra time off. As of Monday, WR Eddie Royal was still not practicing as he continues to recover from a knee injury. - Patriots WR Danny Amendola (knee) missed week 12 at Denver. Amendola did not travel with the team and should be considered week-to-week. Meanwhile, fellow WR Aaron Dobson has been ruled out for the rest of the year with an ankle injury. With Julian Edelman (foot) still out for a few weeks, the Patriots will turn to Keshawn Martin and Chris Harper behind Brandon LaFell in three-wide sets. Rob Gronkowski suffered a bruised knee after taking a low hit to his leg in week 12. Gronk is considered week-to-week at this point, though New England has yet to rule him out for week 13. Scott Chandler will be Gronk's replacement if he does miss any time. - Jeremy Hill left the Bengals' week 12 win over St. Louis with an ankle injury. Hill appeared to injure the ankle in the first quarter, only to return before leaving again in the fourth quarter. Giovani Bernard would become the Bengals' feature back if Hill is forced to miss any time, with Rex Burkhead and Cedric Peerman in line to see more work. TE Tyler Eifert also left the game with a pinched nerve in his neck and did not return to the game. If Eifert misses time, the Bengals will turn to the duo of Tyler Kroft and Ryan Hewitt. Jeremy Hill left his team's game with an ankle injury in week 12. - Cleveland wideouts Taylor Gabriel and Andrew Hawkins (both concussion) missed week 12. Neither was able to practice ahead of the game and both should be considered week-to-week. QB Josh McCown left the game with an injury to his right (throwing) shoulder and did not return. Austin Davis replaced him, with Johnny Manziel serving as the third-string quarterback. McCown was clearly bothered by the injury, removing himself from the game after trying to play through the pain. 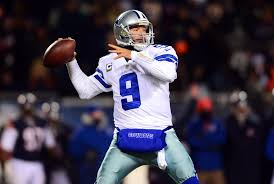 - Tony Romo re-injured his collarbone in the Cowboys' Thanksgiving Day loss at home to Carolina. Romo had already missed several weeks with a similar injury, making this the third time in his career that he has suffered a fractured clavicle. He will be placed on season-ending I.R. Matt Cassel will ostensibly take over at quarterback and see out what has been a very difficult year for Dallas. - Peyton Manning (foot) is set to miss as much as 3 more weeks as he continues to heal. Brock Osweiler will continue to start in Manning's place. Manning's foot is in a cast following a meeting with a specialist last week. - Lions wideout Lance Moore (ankle) left the Lions Thanksgiving Day win over the Eagles and did not return. Moore has made some critical plays for Detroit as a key reserve this season. Corey Fuller took his place behind Calvin Johnson and Golden Tate. - Dolphins wideout Rishard Matthews is dealing with multiple broken ribs and will likely miss a few weeks. DeVante Parker could see extra playing time while Matthews recovers. - Packers receivers Ty Montgomery (ankle) and Jared Abbrederis (ribs) both missed week 12. Montgomery is nearing a return, but both players should be considered week-to-week. - Colts RB Ahmad Bradshaw left his team's week 12 win over Tampa Bay with a wrist injury. The oft-injured veteran did not return and was placed on season-ending IR Monday. Dan Herron is the next man up to back up Frank Gore, who is playing through several minor injuries of his own according to coach Chuck Pagano. - Jags WR Allen Hurns left his team's week 12 game on a stretcher after sustaining a concussion. Hurns hit the ground awkwardly while attempting to make a diving catch over the middle. He did give two thumbs up to the crowd as he was stretchered off, but should be considered very questionable, if not doubtful as week 13 approaches. - Chiefs RB Charcandrick West missed his team's week 13 win over Buffalo with a hamstring injury. West was injured in week 12, and his absence opened the door for Spencer Ware to have a nice game against the Bills. De'Anthony Thomas (concussion) also missed the game and should be considered week-to-week. - Taiwan Jones missed Oakland's week 12 win at Tennessee with a knee injury. Jones is dealing with a PCL sprain, and should be considered week-to-week. Latavius Murray and Roy Helu are the Raiders' top-two backs. - Marshawn Lynch has undergone surgery on the abdominal issue that has hampered him throughout 2015. Beast Mode is expected to miss about a month, with Seahawks' coach Pete Carroll saying he expects the veteran to return before the end of the year. Thomas Rawls and Fred Jackson will carry the mail while Lynch heals. - Carlos Hyde missed week 12 in San Francisco as he continues to recover from a foot injury. Hyde is week-to-week, and Shaun Draughn will continue to see the most of the backfield work in Hyde's absence. TE Garrett Celek left the team's week 12 game against Arizona with an ankle injury. Vance McDonald will continue to operate as the team's main threat at tight end in the aftermath of the Vernon Davis trade. Tony Romo is done for the season after re-aggravating his collarbone injury. - The Rams were without both backup QB Case Keenum (concussion) and K Greg Zuerlein (groin) in week 12. Keenum should be monitored as St. Louis has seen starter Nick Foles struggle in recent weeks. Zach Hocker kicked in place of Zuerlein. - Zach Ertz (concussion) and Sam Bradford (concussion/shoulder) are both close to returning for week 13. Ertz is reportedly "advanced" in the league's protocol, while Bradford has cleared his way through, though his shoulder injury may still be a concern. Both players will try to practice this week ahead of the Eagles' next game at New England. - Despite returning to practice nearly a month ago, Bucs tight end Austin Seferian-Jenkins (shoulder) has yet to be cleared for contact and missed another game in week 12. ASJ has reportedly been close to returning each of the last three weeks, but can not clear the last hurdle. Brandon Myers, Luke Stocker, and Cameron Brate will continue to fill in while Seferian-Jenkins heals. - Redskins TE Derek Carrier (ankle) left his team's week 12 win over the Giants and did not return. Carrier is a name to watch as he backs up the explosive but oft-injured Jordan Reed in Washington's offense. RB Chris Thompson injured his shoulder in the game and is day-to-day. The Lions and Packers will release their first injury reports on Tuesday, with the rest of the league following suit on Wednesday. Good luck in week 13.